At the 19th Party Congress later this year, the new Politburo Standing Committee of China’s ruling Communist party will be revealed to the entire world, headed by President Xi Jinping. Within this new line up of China’s most powerful men is expected to be Xi’s successor, who will assume the presidency in 2022, once Xi Jinping finishes his two terms. Recent reports from within the party apparatus however indicate that President Xi, already China’s most powerful leader since Deng Xiaoping, has delayed announcing an heir. If true, these reports will confirm what many observers have long suspected; that the ‘paramount leader’ seeks to maintain his grip on power until 2027. Whilst the office of president is explicitly limited to two terms under the constitution, no such limits are in place for Xi Jinping’s likeliest means of retaining power, namely by remaining Party Secretary of the Communist Party. The system based on the concept of “first among equals” installed by Deng Xiaoping in 1979 is already straining under Xi’s program of consolidating power around himself. His staying on beyond 2022 would be an unprecedented move in China’s post-Mao history. A decade ago when Hu Jintao assumed the presidency, his immediate predecessor Jiang Zemin remained on for a year as Chair of the Central Military Commission before eventually stepping down. During this time Jiang consolidated the enormous levels of power he’d accrued during his own presidency, placing tribunes and loyalists in key sectors of the economy and military. Whilst Jiang retained though cronyism a high degree of influence within the Communist Party, he was never in a position to govern via proxy. Thus Hu Jintao, whilst regarded as one of China’s weaker presidents, nonetheless retained a degree of control over the Communist system. Xi Jinping however may seek to go beyond exerting influence through cronyism and attempt to emulate China’s last strongman Deng Xiaoping. In spite of stepping down as Chairman of the Central Military Commission in 1989, and retiring fully in 1992, Deng was widely viewed as the power behind the throne until his death in 1997, after which Jiang Zemin moved to fill the vacuum. All indications point that Xi may seek a similar path pursued by Deng Xiaoping and to do so he has gone to war with Jiang Zemin’s network within the Communist Party. Since adopting the presidency in 2012, Xi Jinping has consolidated considerable amounts of personal power. In the last few years he has marginalised his own Prime Minister Li Keqiang, a loyalist of Hu Jintao and other politburo members with ties to former presidents. President Xi chairs multiple policy planning committees that direct China’s foreign policy, notably having a direct say in ‘core areas of interest’ such as Taiwan and the South China Sea. In 2013, Xi also created two new committees, the Central Leading Group for Comprehensively Deepening Reforms (CLGCDR) and the Central National Security Commission (CNSC), giving him greater personal control over China’s internal security dynamics and the direction of economic policy. In these actions, Xi has broken the unwritten rule within the Chinese Communist Party by arresting figures close to his predecessors. In a widespread and comprehensive anti-corruption campaign, Xi has arrested the likes of Ling Jihua, a prominent former aide to Hu Jintao, for corruption and ruthlessly dismantled former president Jiang Zemin’s tributary network. In what has been referred to as the ‘tigers and flies’ campaign, over a million Chinese officials from all levels have been arrested alongside previously untouchable players such as former Politburo member and Jiang loyalist Zhou Yongkang. The arrest of Zhou is particularly significant, not only given his stature within the CCP as a former politburo member responsible for China’s internal security but as the figure widely viewed as Jiang’s enforcer, commanding his private security forces. With key lieutenants of Hu Jintao and Jiang Zemin marginalised and arrested, Xi has in the last three years ensured that the vacuum has been filled with his own factional allies. By creating a power base of his own within the Chinese system, Xi has been able to challenge Jiang Zemin’s grip and become the first leader since Deng Xiaoping to be designated the Communist Party’s “Core Leader”. Nowhere has this been more plainly demonstrated than through the consolidation of Xi’s political control of the People’s Liberation Army. Although officially subject to the will of the party, in reality the military has long enjoyed a degree of autonomy within China and is riven with internal factionalism. President Xi’s anti-corruption campaign however is breaking up the old power monopolies that Hu Jintao had little control over. Thousands of personnel including hundreds of senior officers and generals have been purged and arrested. Senior flag officers with close ties to Jiang Zemin such as Xu Caihou and Guo Boxiong were humiliated by state media in a deliberate warning to others. With key players off the chessboard, Xi is pushing through strident reforms of the PLA’s domestic force structure. China’s seven traditional military regional commands based at Shenyang, Beijing, Jinan, Nanjing, Guangzhou, Chengdu and Lanzhou have all been disbanded, replaced instead with five new theatre commands. Though presented as an effort to streamline the PLA in the event of a crisis, these reforms have also broken up the power networks within those commands, ensuring no single regional commander can maintain cadres and networks of loyal officers that operate outside the Communist Party’s hierarchy. In April 2016, state media announced that Xi Jinping was being awarded a new rank as the PLA’s Commander-in-Chief. This was a clear signal intended for a Chinese domestic audience and Xi’s rivals. By using a rank not seen since the Korean War and one not used by either Mao Zedong or Deng Xiaoping, President Xi was stating clearly that the PLA is under his control. With Xi now the Core Leader and Commander in Chief of the PLA, he has it seems a strong position ahead of the 19th Party Congress in 2017. Here the CCP rules on age play to Xi Jinping’s advantage. Five of the seven current members of the Politburo Standing Committee are aged 69 or over and will be forced to retire in 2017. This removes figures chosen by Jiang Zemin, notably Liu Yunshan, China’s propaganda chief and the man most often cited as Xi’s principal rival due to his close ties to Jiang. This leaves Xi Jinping and Premier Li Keqiang as the two figures who will continue through the CCP’s selection process. In contrast to previous transitions, President Xi has not publicly indicated any potential successors who will be elevated to the Politburo. Within the Communist Party, the transition process is generational. Xi and Premier Li are members of the fifth generation of leaders born in the 1950s, which should via tradition elevate potential successors born from 1960 to 1979, the 6th and 7th generation respectively. By contrast Xi’s predecessor Hu Jintao, the 4th generation’s paramount leader, had indicated as early as 2005 that Xi Jinping, at that point Zhejiang’s party secretary and Li Keqiang, then Liaoning province party secretary, would be elevated to the Politburo in 2007’s 17th Party Congress. In Xi’s case, he was moved to the highly prestigious role of Shanghai party chief. If Xi were keeping to this tradition, we would expect to see rising stars from China’s sixth generation being placed in key positions of power ahead of their ascension in 2022. Instead, fifth generation figures, effectively peers of Xi Jinping, are being elevated to the roles of regional party secretaries. Since 2012, party secretaries Guo Jinlong of Beijing, Chen Quanguo of Xinjiang, Li Hongzhong of Tianjin, Sun Zhengcai of Chongqing, Han Zheng of Shanghai and Hu Chunhua of Guangdong have all risen in prominence. Of these men, all bar Sun Zhengcai were born in the 1950s and several like Chen Quanguo and Li Hongzhong are known to be assiduously loyal to Xi Jinping. Establishing the runners and riders within the Communist system is notoriously difficult due to the opaque nature of China’s government. However, elevation to the position of Party Secretary of major urban areas such as Beijing, Shanghai, Tianjin, the massive export hub of Guangdong and volatile Xinjiang are important signals. Absent a major scandal, such as the one which destroyed Bo Xilai, the former Party Secretary of Chongqing, the probability is high that these candidates are destined at some point for a seat in the Politburo. The fact that it is China’s fifth generation leaders who are being elevated to power, thus remaining the base of the Communist Party’s leadership until the 20th Party Congress in 2022, reflects the clearest indication yet that Xi Jinping will seek to retain power in some form until 2027 and crush any rival who stands in his way. As previously stated, predictions are always risky concerning the CCP but come the 19th Party Congress in November of this year, a strong indicator that Xi has successfully solidified his powerbase would be the removal of Premier Li Keqiang, the sole remaining ally of Hu Jintao on the current Politburo Standing Committee. Under previous traditions Li would serve the full 10-year term until 2022. However he is widely viewed as isolated within Xi’s administration, following the turmoil in China’s stock markets in 2015–2016. There is speculation that Wang Qishan, a serving Politburo member and the key head of Xi’s anti-corruption campaign, may replace Li in November, in violation of rules requiring Wang to retire. Although technically ranked sixth in the Politburo, in terms of influence the 69-year-old is widely regarded by analysts as second only to the Chinese president. If Wang is indeed elevated we would then expect a successor to Xi as president to be positioned ahead of 2022. Xi would then remain on as Communist Party Secretary and likely continue chairing the Central Leading Group for Comprehensively Deepening Reforms (CLGCDR) and the Central National Security Commission (CNSC), thus retaining his personal control over internal security and domestic economic policy. Whilst increasing his own personal power substantially, Xi Jinping’s motives may be more orientated towards China’s future than his own. The greatest challenge to the legitimacy of the Chinese Communist Party comes from the inequalities and political contradictions unleashed by a Communist state embracing globalisation. China is not immune to the trends of populism sweeping the world. Discontent is rising in the rural interior over the striking levels of inequality, with many older Chinese feeling that globalisation has benefited the country’s ruling elite at their expense. Within China we have seen the rise of a small yet virulent group of Neo-Maoists that appeal to a conservative nostalgia and ideological clarity offered by Mao Zedong. The political contradiction that is aiding their rise is that the current generation of Communist leaders have rejected all of the ‘Great Helmsman’s’ economic policies yet retained Mao as a political and nationalist figurehead, necessitating the whitewashing of his actions during the Great Leap Forward and Cultural Revolution. As a result, Mao’s greatest crimes have been marginalised and he remains an enormously popular figure whose utopian ideals for a fairer society strike a chord amongst the millions of Chinese who feel left behind by the party he once led. Thus leaders such as Xi Jinping face an internal threat from a ghost from China’s past they can’t fully repudiate nor embrace. The rise of the Neo-Maoists is however a symptom of the wider economic concerns facing China, namely the slowdown of its economic model. China grew at 6.7% in 2016 with estimates that it could grow at 6.5% in 2017. This marks a dramatic drop from the yearly 10% growth witnessed from 1990 to 2010. Announced in November 2013, Xi Jinping plans to transition China’s economy from one based on exports and debt fuelled infrastructure spending to a market-led, consumer economy. This transition is well underway but the Communist Party is vulnerable during this time. Inequality is provoking internal instability, state owned enterprises remain heavily indebted and corrupt and a further slowdown in China’s economy provoked by a banking or property crash would plunge the nation’s fragile transition into turmoil. The spectre of Tiananmen Square looms large for the Communist Party and with the advent of social media, the prospect of millions of Chinese citizens returning to the streets is a real one, should the economy contract further. China is burning through its currency reserves in support of the yuan just to maintain its faltering growth levels and prevent such a scenario. 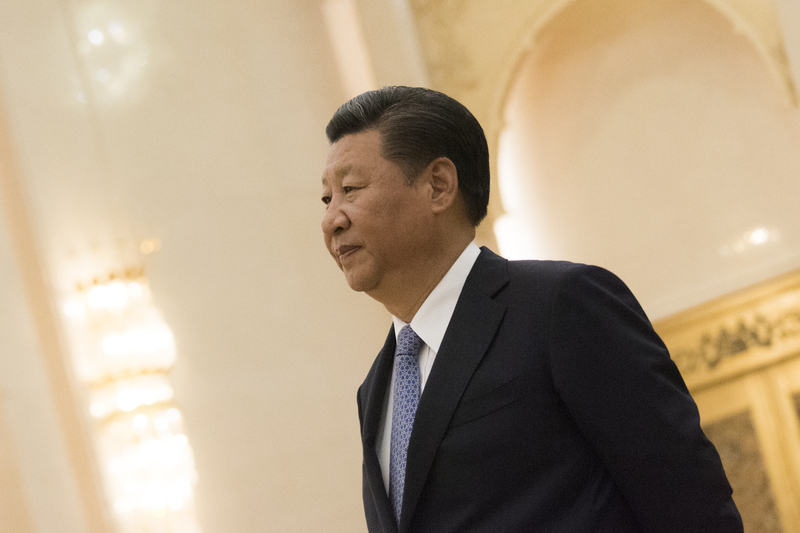 With this as context, Xi Jinping’s recent actions in consolidating power suggest that his reading of events requires China to have a president with the legitimacy and power to guide its difficult transition to a market economy. This involves absolute control of the party, the military and policy making and is unencumbered by a 10 year term in office. Only with such a president, Xi feels, can China undertake the massive economic and structural reforms that ensure China, and by default the CCP, will thrive where other Communist regimes, namely the Soviet Union failed. Such a president would be the most powerful figure seen in modern China since Deng Xiaoping and Xi seems convinced that the person best equipped for this role is none other than himself. The internal political challenges facing Xi however are grave. His grab for power and anti-corruption campaign has made China more authoritarian and made many enemies within the party. In November 2016, in a statement carried by China Daily, the voice of the CCP following his designation as Core Leader, the president warned that “A handful of senior party officials, overcome by their political cravings and lust for power, have resorted to political conspiracies, while forming cliques to pursue selfish interests”. Earlier that year in March, an anonymous letter leaked from CCP figures telling Xi to resign his office. It is clear that members of rival Communist factions are organising against Xi or at the very least impeding his reform agenda. Having assumed control over domestic and economic policy, should China face a major economic slowdown and he has not consolidated power in the run up to 2022, Xi could find himself the scapegoat for this failure. The loyalists of former president Jiang Zemin or Hu Jintao would then not hesitate to overthrow him. In an inverse of the present balance of power, Xi Jinping would then be at their mercy. Such a scenario is not unlikely, given declining growth levels and thus both Xi Jinping and China go into 2018 facing an uncertain future. John Pollock is the Editor of the China Policy Institute’s online magazine CPI: Analysis. Image Credit: CC by Chairman of the Joint Chiefs of Staff/Flickr.